All registration is online and must be completed by midnight on May 15, 2019, or when we reach our limit of 1,500 riders, whichever comes first. We no longer offer paper registration. The approximate time it takes to process a paper registration is about an hour and with limited resources AND less demand, it no longer makes sense to offer paper registration options. If you’re reading this on a screen, you can register online. If a friend is reading it to you and you don’t have access to a computer, have your friend register you. Children ages 6-15 (November 19, 2018, to May 15, 2019): $95. Children ages 2-5 (November 19, 2018, to May 15, 2019): Free. Notes regarding children: Children ages 2-15 must be registered separately. Age is based on what a child’s age will be as of June 15, 2019. Children under age 2 may not ride on a bike or in a bike trailer on GOBA. After you register, you will receive an acknowledgement email with links to other forms you need to complete — including a form for medical and emergency contact information. You may receive other emails that include links to add-on options that you can reserve separately. Please read all GOBA emails carefully. You will also receive via email the March, May and June newsletters. Directions to Bowling Green will be in the June newsletter. Your rider packet — with wristband, tour patch, etc. — will be at check-in in Bowling Green. Refund requests must be sent via email to goba@outdoor-pursuits.org by May 15, 2019. Refunds will be granted up to that date, minus a $55 processing fee. No refunds after May 15, 2019, for any reason. You may transfer your registration to another person only by following these procedures: The **original** registrant sends an email to GOBA at goba@outdoor-pursuits.org stating the intent to transfer a 2019 registration, subject to a $20 transfer fee. Include the name, home address and email address of both the original registrant and the person who will receive the transfer. The person who will receive the transfer must register himself or herself by May 31, 2019, and pay the $20 transfer fee. If the original registration rate was lower (e.g., “early-bird”), GOBA will give the transferee a discount coupon code to use during registration in order to get the lower rate. Once the transferee has completed registration, a full refund will be issued to the original registrant (the $55 processing fee will be waived). Please note, a transfer request may be denied if all procedures have not been followed, including notifying GOBA beforehand about the intent to transfer. All registrations are for the entire week — no partial-week registrations. All participants must register, whether or not they are bicycling. During the registration process, each registrant must complete the Liability Waiver, Indemnification Agreement, Permission to Provide Medical Treatment and Publicity Release (custodial parent or legal guardian signs for entrants under 18). Registrations are not accepted without payment. In order to be a GOBA participant who rides on or is pulled by a bicycle, a child must reach their 2nd birthday by June 16, 2019. Note the age restriction does not apply to registered children in a car, accompanying other registered riders. Also be advised, GOBA volunteer support vehicles do not carry child-safety seats. There will be no refunds in the event of cancellation due to natural disasters, acts of god or acts of terrorism. For additional policies, see “How To GOBA” and the Car-Camper Pass and camper services page. The cost of optional extras is not included in the GOBA registration fee and must be paid online unless noted otherwise. To learn more about fees, deadlines and policies for Car-Camper Passes and camper services, please go to the camper extras page. The GOBA registration website offers options to order 2019 GOBA T-shirts for $19 and jerseys for $65. The deadline to order in advance is May, 15, 2019. There will be no refunds. UPDATE: Pre-ordered T-shirts and jerseys will not be shipped in advance and can be picked up from the vendor during GOBA, starting June 15 at the camp in Bowling Green. Additional shirts and jerseys will be available for sale during GOBA. Check goba.com to see the T-shirt and jersey designs and sizing charts. Visit the camper extras page to learn more about deluxe camping, community camping, towel and chair services offered to GOBA riders by Knight’s Kingdom. Your registration already includes free parking for your vehicle all week in Bowling Green. The Car-Camper Pass is for participants who wish to bring their vehicle along each day into the other GOBA campgrounds. The Car-Camper fee is in addition to the registration fee. The driver and all occupants will need to register, and pay the GOBA registration fee for all and one Car-Camper fee for the vehicle. The Car-Camper Pass is only valid in a particular camp for the nights that GOBA is camping there. Please see Car-Camper policies and procedures and vehicle requirements before choosing this option. Deadline to purchase the pass is May 15, 2019, and there will be no refunds after May 15, 2019. The drawing will be held in the GOBA office. The winner will be notified prior to GOBA 31. 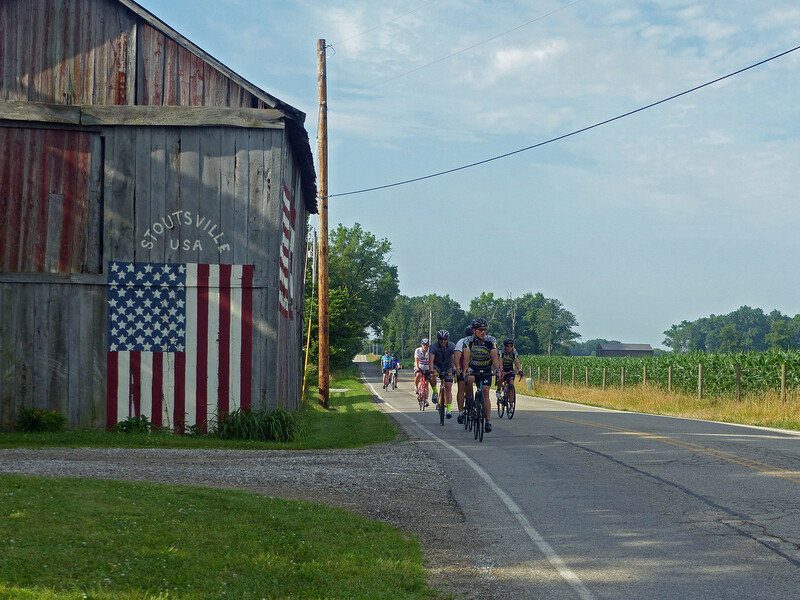 The Great Ohio Bicycle Adventure is owned and organized by Columbus Outdoor Pursuits, a volunteer-based, non-profit organization that provides opportunities and education for outdoor recreation and activities. COP is the largest outdoor recreation organization in Central Ohio, with over 1,500 members of all ages and backgrounds. You will be eligible to take part in activities such as bicycling, backpacking, boating, hiking and camping. You will also have the opportunity to organize trips yourself and develop these life skills in a fun, supportive environment. One-year memberships cost $25 for students and seniors, $30 for adults and $50 for families. A $500 lifetime membership also is available. For more information on membership and activities, visit the COP website.